We open from 6:30am to 23:00pm every day. There are 208 seats, and we offer both A la cart and buffet. We serve breakfast buffet from 6:30am to 10:00am from Monday to Friday, and 6:30am to 10:30pm on Saturday and Sunday. Lunch buffet starts from 11:30am to 14:00pm. Dinner buffet starts from 17:00pm to 20:30pm from Monday to Friday, and 17:00pm - 21:30pm on Saturday and Sunday. The Café One restaurant is situated on the 1st floor of the Pullman Linyi Lushang. 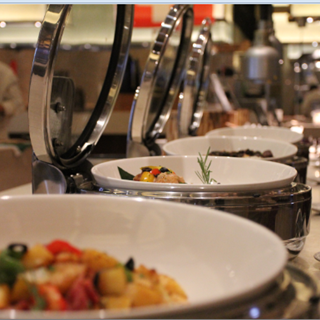 The main feature of Café One is the open kitchen with the delicious food to show to guest. The modern show kitchen all state of the art kitchen facilities. The restaurant is accessible from the local style, where guests can enjoy foreign country amorous feelings dining in Café One restaurant. The all-day dining restaurant Café One features the best of Chinese cuisine mixed with modern European to cater for both western and Asian guests. The a la carte menu will focus on sharing so it reflects a family environment where everyone can sample their favorite cuisine. We also supply international buffet for breakfast, lunch and dinner. 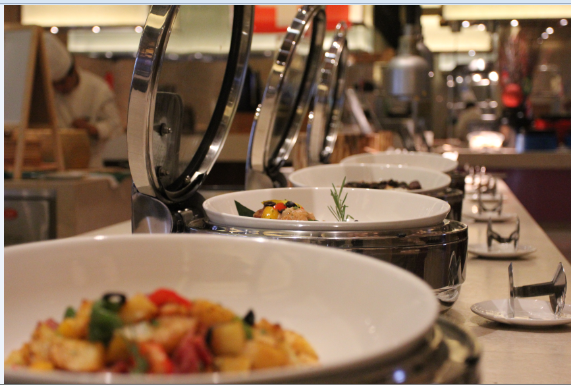 The rotational buffet menu is elegantly designed to ensure no food offering will be repeated during the stay. and also 3 PDRS can offer the guests private dining experience.